The Inbound 2013 conference is in full swing and the crowds a buzz over HubSpot’s unveiling of their new Content Optimization System (COS) as well as a new tool for sales named Signals. Both of these offerings signify new strides in furthering the effectiveness and efficiencies of inbound marketing and a detailed overview these platforms demonstrates exactly how this is true. Mobile optimization: As projected studies show that the majority of adults will connect to the web via mobile devices responsive design for packaging content becomes critical to businesses. This is why HubSpot’s COS was created to adapt content to conform to whatever devise a reader may be using. Integration: HubSpot’s COS in highly integrated allowing marketers to maximize efficiencies, personalize messaging, gather lead data, and analyze performance. 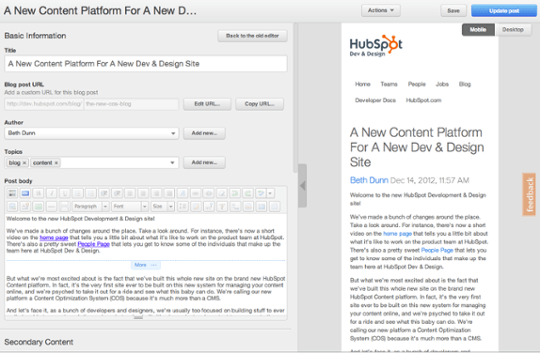 Personalization: Using the same personalization offered in its email marketing and automation tools, HubSpot has now incorporated a "smart" dynamic content and personalization tokens across website pages, landing pages and blogs. Social Search Ready: With social media performance’s influence on search performance HubSpot’s COS places a lot of emphasis on integrating social sharing throughout all of the system’s content features. Speed: Using an incredibly fast and secure content delivery network, the COS allows for quicker loading and appealing design on all devices. 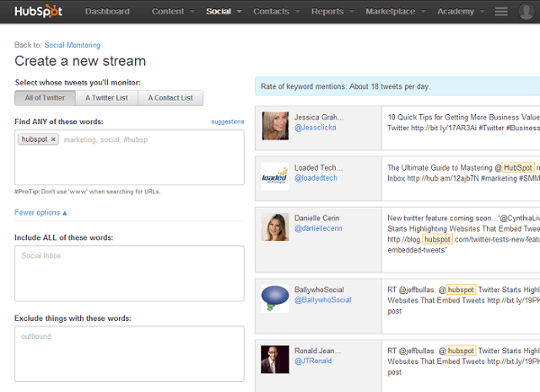 Contacts Database Integration: HubSpot’s COS can now match prospect’s and lead’s Twitter handle to their email account which allows marketers to see that person’s full history of interaction. What’s more Social Inbox can also flag tweets of those in your database with the same name so you can build out your contact’s profile. Monitoring and Alert Segmentation: To counter the avalanche of data marketers sift through, Social Inbox enables them to target audiences in identifying the lifecycle stage of a contact within the tool, and then set up alerts based on your brand’s core priorities, from category and competitive monitoring to tracking key purchase indicators. Company-Wide Benefits: Social Inbox was also designed to involve sales in the by creating alerts that allow sales managers to receive notifications at the mention of specific leads and lead indicators. What’s more, when integrated with HubSpot’s email tool, Social Inbox let service managers reply to complaints and inquiries with personalized emails. Actionable Analytics: Determining social ROI has always been a struggle for marketers, however, with Social Inbox visits, leads, and customers generated by each social media channel can now be easily tracked, and not only that, marketers can also see the total number of clicks or interactions with an individual share, along with the names of each contact that showed interest in that tweet. Revisit Notifications: When a lead returns to your website HubSpot can send a lead-revisit notification directly to a sales rep’s desktop giving that rep information on what a lead is searching for. Email Notifications: Signals allow reps to track emails they’ve sent to learn when that email has been opened or clicked via Gmail, Outlook Web Access, or Outlook.com. 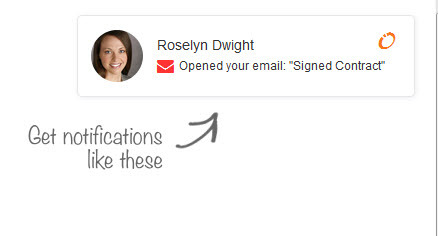 SFDC Email Open Notifications: Signals also allows sales professionals the ability to track the emails they’ve sent from Salesforce, as well as receive notifications on when a new lead is assigned to them in Salesforce. LinkedIn Integration: With its integration with LinkedIn, Social Inbox gives users the ability to mark contacts as VIPs and receive notifications about how that lead is interacting on LinkedIn opening up the possibility for greater one-on-one interaction via the social channel. A New Contacts Report: The new Contacts Report now allows you to customize reports by any list or segment to help marketers better understand how segmented leads navigate content and convert. Android App: For Android users this app will allow them to find mobile-friendly versions of the Dashboard, Sources, Contacts, and Grader. New Marketing Grader: The re-launched Marketing Grader offers a revamped interface, more reliable data and a Mobile Responsive Design. iPhone App Features: Users now have a calendar view for publishing, a monitoring tool for Twitter, and a view of their contact lists along with the ability to add a contact. These new tools and platforms offer inbound marketers a wealth of opportunity. And in keeping with their focus on people first, HubSpot puts its marketing where their mouth is!